Outrageous Fortune – Hey, Look! A Writer Fellow! But I always liked fortune cookies — not for the taste, which was, at best, meh, but for the secret message. Opening one always made me feel like a spy. So, poop smell or no, as least I could look forward to that. I bring this up because there has been some fortune cookie news that has recently come to my attention. Some parents complained about the fortunes they received. These fortunes, they asserted, were “suggestive” and inappropriate for children. Shocking, I know. I hope my blog dosn’t lose its “G” rating. Complaints like this don’t surprise me. Some people’s lives are defined by being outraged. So this kind of stuff is par for the course. Wonton Foods, the world’s largest fortune cookie baker and the target of this parental outrage, responded to the complaint. In a public statement, the company announced that, from now on, it would no longer print fortunes of a romantic nature. This didn’t surprise me either. All things considered, who cares if the “You will meet a tall, dark stranger,” fortunes go missing? Oh, and congratulations, Wonton Foods, for you have already failed the Won’t-Upset-A-Single-Person Test, for I am offended by your fortune’s lameness. OK, I’m done with the snarkiness. Listen, Wonton, I understand your position. I do. I understand why you decided to remove the romantic fortunes. I think it is absurd that you were pressured to do so, but I get it. But you will never not offend all of the people all of the time. The world is full of nutty people and there is no way to anticipate what will set them off. Could you have ever predicted the firestorm that accompanied, “One who admires you greatly is hidden before your eyes?” See my point? So please put that ‘not offending anyone” idea out of your mind right now. Instead, take solace in knowing that, by employing good taste and common sense, you can avoid offending most people. That’s good enough. And when more complaints trickle in – and they will – deal with them on a case-by-case basis, apologize freely, and move on. A real fortune I received. Food for thought. That said, there is a silver lining here, Wonton. Why not use your new “No Romance” policy to try something different and exciting? The most creative solutions often emerge when creators are confronted with barriers and restrictions. Your new fortunes could be enigmatic. They could offer genuine insight. Be witty and wise. Ask a soul-searching question that can serve as a conversation starter. 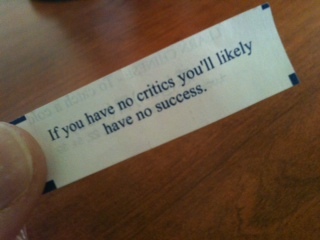 You could actually use your cookie to provide an after dinner morsel of profundity. How cool is that? Please contact me, Wonton. I’d love to hear what you think. I’m easy to spot; I’m the guy eating scrambled eggs. Commenters! My wonderful, creative commenters! Do you have a fortune you would like to pitch to Wonton Foods? Write it below! Show the fine folks at Wonton how it’s done! If there’s no tall/dark/handsome fortunes left, I’m never eating wonton soup again. Or eggs. Lottery tickets are so unsatisfying because you just lose or, well, lose. But those titillating fortune cookies offered a girl hope and some Friday nights watching bad TV and eating rice that I never realized smelled like poop (but I’m sure I’m desensitized after years of picking up after my dog) a good fortune cookie could go along way. Thanks for bringing this key issue to everyone’s attention. I’m penning a letter to my senator as soon as I have a good cry. Oh, don’t cry, Laurel. Good fortunes can be found in many places. And who knows? Maybe the fine folks at Wonton Foods will soon see the error of their ways! Bologna doesn’t smell like poop, silly! I think political correctness has gone too far when a fortune cookie company chooses to be censored..so as not to offend. What next? I happen to like positive prophetic fortunes and will from time to time save the ones that inspire me to move into a certain direction or validate one that I’m heading into. The day before I met my husband, I got one of those romantic fortunes…and it worked out quite well for me…I’m a believer…or a dreamer, which ever fits best. Two recent ones that I kept (in my wallet) are, “A quiet evening with friends is the best tonic for a long day.” It fits my mindset and lifestyle. The next, ” Luck is what happens when preparation meets opportunity.” That one is a real goal oriented one which emphasizes that people need to do something in order to have lucky things happen to them…preparation always involves doing. So true about Pinterest. But if you wanna cookie with your fortune you gotta bake it yourself. A bad cookie on Pinterest is better tasting than a fortune cookie, that’s for sure. Stacy, LMAO!! You sound just like a friend of mine (who once went through an entire day on Facebook adding “in bed” to everything he posted). One should never be outraged in bed, that’s for sure. I sooooo agree with your blog!! Love it! You’re a poet; gimmie your best shot. Write a fortune for Wonton! I should be outraged that you think “moo shu pork” is Chinese food, but I’m too busy laughing! 😉 I’m often amazed at what people get in a knot about. Getting mad is so bad for one’s health. Anger is certainly not good for your health. And a person who gets angry about fortune cookies probably gets angry quite often. But what if I don’t know what I’m trying to find out? I’m up the creek then, eh? I knew I could count on you, Cathy. Yeesh! Some people are afraid of their own evil minds. I live my life by fortune cookies, or at least the ones I (all too often) eat for breakfast, and I’ve never received one that I couldn’t share with my kids. A secret admirer doesn’t need to be suggestive of anything other that the possibility that a shy classmate would like to sit with you at lunch. I’d skip the offensensitivity unless it says, “Someone secretly wants to lick your ankles.”—though if your neighbors have a dog, that one still might be perfectly innocent. I, too, am waiting for my three-book deal fortune. I wish you luck, Ms. Moist Ankles. I could go on, but I’m now thinking that this plan may backfire, sending rice grower stocks plummeting and ensuring an overall downturn in the take-out food marketplace as children boycott all cuisines associated with poopy fortunes. Important lessons, to be sure, but we need fortunes, Jilanne, not a to-do list! I started wondering what company my local Chinese restaurant used for their fortune cookies. So, I looked in my refrigerator and to my delight there sat, on the door shelf, one fortune cookie. I grabbed it looking to see who made it, Dah Sing Noodle Co., located in Stone Mountain, GA. Then I cracked it open to see what my fortune would be, romantic or bland. Not sure what to make of it but it could be a good conversation starter, “You will step on the soil of many countries”. Also, on the back, I’m given these lucky numbers: 2, 4, 14, 19, 36, 40. I think this tops the new vision of Wanton Food’s fortunes, what do you think? I second Mamabeana – Sweet and Sour Chicken is the gateway drug to Chinese Food. 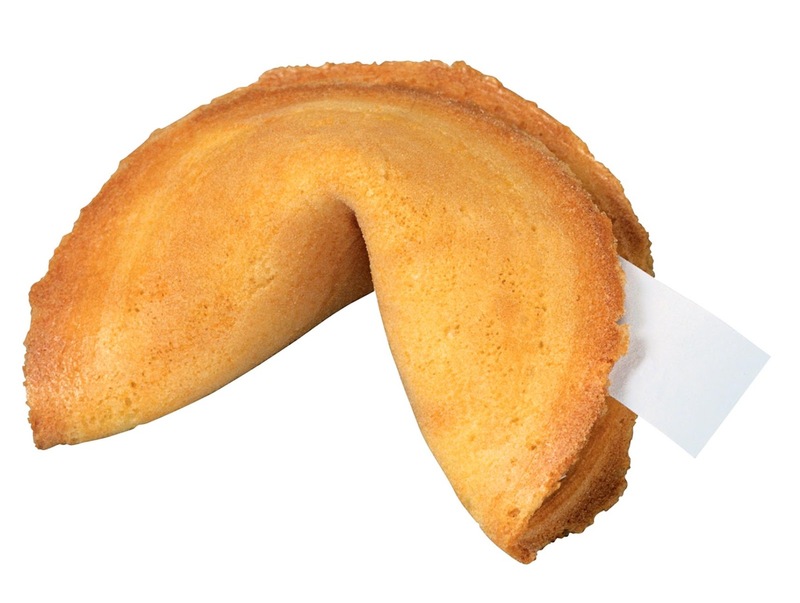 Or maybe that’s what the fortune cookies do – lure you into the sordid world of Chinese Food with a delightfully-crunchy-sweet-I can’t-put-my-finger-on -the-flavor cookie. Also shame on those parents for not being able to explain away fortunes. A tall, dark stranger could be Voldemort or Shaq. A tall, dark stranger could also be a bear. The cookie might be trying to prevent a mauling! I don’t even want to imagine how many bear maulings the Wonton company is going to be responsible for with this obvious early warning system removed. Those outraged parents will have blood on their hands! So true, laurimeyers, so true!! Though much better than “You make every day special,” “You will step on the soil of many countries,” doesn’t do it for me. That is perhaps the most perfect fortune I have ever heard. Sorry, getting read for work and these are the fortunes that pop in my head before I pop into the shower. These are first class, Vanessa! But how does one wear a fortune cookie as an earring? Maybe the cookie company could outsource to you guys! Some of these have been great! BTW- Why didn’t you mention the B&N appearance here? (Thursday, April 18 5:00pm Barnes & Noble in Springfield, NJ). Come support Mike supporting educators! I plugged the appearance on my Facebook page, but, yes, you all can see my dog and pony show on the 18th! Do stop by. There you see, I don’t mind offending people boo ha ha! ‘wanton something fast, hot and fruity? Plum pudding new on menu’ 😉 Hope that doesn’t affect your G rating either lol. I believe our G Rating is still secure. You’re not offending anyone. The truly unbalanced never consider themselves unbalanced. It is always *the other person* who is unbalanced. I’d pitch some really wicked fortunes — fun things! Go right ahead! Just remember, I gotta G Rated blog here. I think everyone who commented covered it all–outrage over the outraged loonies among us, good fortune ideas, and support for your blog. I love both your creativity and writing. Your fortune cookie should read: “He who writes about the small things in life tells the truest story.” Thanks for my Friday morning day brightener. That, I think, is a wonderful fortune for anyone. Thank you for your kind words, Liesa. BTW: How is your book doing? Thanks for asking! I have reviews from both Publishers Weekly and Kirkus now, and received the final on the book cover yesterday (thank goodness they amended it to look less like a spiritual and more like a murder mystery). The book launches in June and I’m hoping for some decent sales because I have a big family, and they all promised to buy a copy. We’ll see. BTW: I set my following for a weekly review of your blog. Is Friday the best day for this, or do you publish on a different day? That’s fantastic, Liesa! This book is your first, right? If so, you are off to an amazing start; PW didn’t bother to review my book. Are you setting up a book tour? And to answer your question, I post here every Sunday. But, hey, you are welcome to comment here whenever you want! The world has gone MAD. We aren’t allowed to do anything any more for fear of upsetting someone. I love Chinese food. Not so bothered about the fortune cookie. Even less so now. Great post. You live across the pond, yes? Do you see similar bursts of oversensitive outrage where you’re from? Absolutely. This is a worldwide phenomenon. We have bizarre health and safety issues where we don’t seem to be allowed to do anything any more. I tell you, we’ll not be allowed to go swimming soon as we might drown, or congregate in groups in case we accidentally smother someone. Well, let’s hope things don’t get quite that far, my friend (though I do wish some people would take a step back when they talk to me). Now that is profound! Well done, Hazy! But then Wonton will be sued by the Robert Frost estate! So much for pleasing all of the people all of the time!